Based on a John Le Carr novel, Tinker Tailor Soldier Spy follows retired spy George Smiley (Gary Oldman) as he attempts to discover which top ranking of MI6 is a Soviet Spy. It’s an amazing cast: Gary Oldman, Colin Firth, Tom Hardy, Mark Strong, John Hurt, Ciaran Hinds, Kathy Burke and Benedict Cumberbatch just to mention a few. I just wish I’d seen it in the cinema. It is relatively slow-moving, with not a lot of action, and I found at home that my attention kept drifting and I didn’t really follow it all. None the less, it was clearly an extremely good film that should have kept my attention. I blame me on this one. 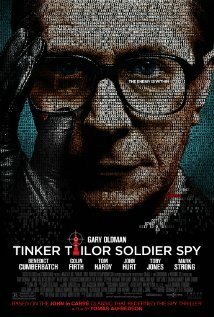 Tinker Tailor Soldier Spy was nominated for Oscars for Best Performance by an Actor in a Leading Role (Gary Oldman), Best Writing, Adapted Screenplay (Bridget O’Connot and Peter Straughan) and Best Achievement in Music Written for Motion Pictures, Original Score.